Simplifying retail for better patient care. When your pharmacy handles the majority of discharge transactions, lines at the pharmacy can grow out the door. With Emporos At Your Side™, you can reduce pharmacy lines and deliver prescriptions and OTC items right to patient bedside. Prevent the need for family or caregivers to visit the pharmacy and ensure the right patient gets the right prescription, and that it actually get fulfilled! This lightweight device integrates with mobile iOS/Apple cameras for scanning 2D and 3D barcodes, with easy access to Will-Call prescriptions in one step with the touch of a finger. With one touch on the device, scan OTC product barcodes for delivery and purchase at bedside. Search for items by UPC or item description, and item indicators highlight pseudoephedrine items, QHP indicators, and taxable items. At bedside, users can login with their Mobile Daily Access code, a unique six digit code that expires at custom times. Patients can view their prescriptions and their totals, and Emporos At Your Side accepts all payment tenders at bedside. 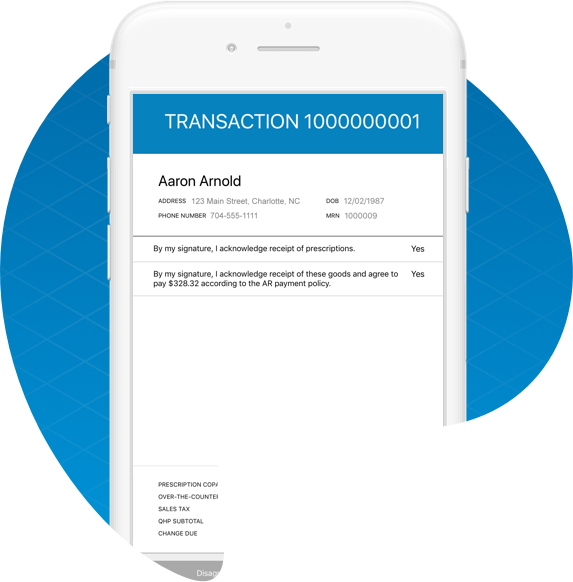 The Accept Payment module of Emporos At Your Side defaults to camera mode to easily scan ID barcodes, reducing wait times and getting patients discharged in less time. The device is unable to accept tender until proper ID requirements are met, staying compliant. Automatically switch to signature capture, with full screen horizontal positioning to make it easier for patients to enter their signature. Single signature capture for all requirements reduces the time for discharge.